"Laminate floors, beautiful master bathroom, large bedrooms!" Address: 391 Knotwood, Large home on desirable corner lot! One of the largest 2/2 models in Naples Estates! This home has 1375 square feet of living area under air and a large screened in lanai on the side. 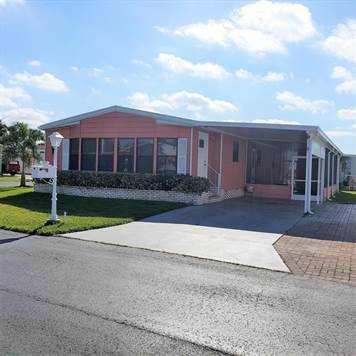 Located in Naples Estates, a 55 and up age restricted community with lot rent of $745 per month which includes water, sewer, garbage pickup, and use of all amenities. Two pets are permitted per home with some breeds of dogs prohibited. Park approval is required by all residents to purchase. Naples Estates has so much going on - new state of the art resort style ballroom and activity center, fitness center, billiards room, large pool with spa treatment, bocce ball courts, pickle ball courts, 18 hole miniature golf course, dog parks and more! Not only is this community close to shopping, public golf course, movie theaters, restaurants, and banks, it is only minutes to beautiful historic downtown Naples 5th Ave. and 3rd Street shopping district and our beautiful white sandy beaches! FOR MORE INFORMATION OR TO SCHEDULE AN APPOINTMENT TO PERSONALLY VIEW THIS HOME, PLEASE CALL LISTING AGENT. ▪ Great community with many new amenities under construction. Get in now before the prices of the homes start going up!